Twenty years ago, widespread adoption of the world Wide Web Web transformed nearly every aspect of how we conduct business. New marketing channels emerged overnight. Information silos came crashing down. New communication modalities emerged. Even our vocabulary changed. In the last few years of the 20th century, amid the scramble to mitigate the dreaded Y2K doomsday event, enterprises were rapidly integrating the Web into their processes, both internal and external. Early digital marketing initiatives manifested in the form of simple HTML web pages and basic email campaigns while early cloud-based CRMs and ERPs began to firmly root themselves into enterprise business culture. 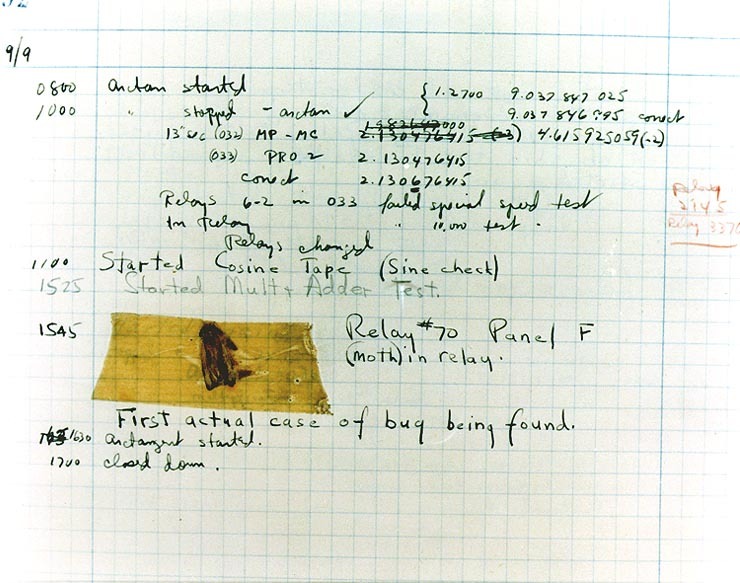 These events represent the first epoch in the history of the Internet. Enterprise marketing departments had only a brief chance to catch their collective breath before the second epoch of the Internet came crashing onto the scene: social media. A decade-long scramble to integrate with the major social media channels like Facebook and Twitter was a particular challenge because of how quickly these outlets were changing the way their own software worked as they reacted to a shockingly fast rate of adoption by hundreds of millions (and now billions) of users. Social media changed the business landscape profoundly because it introduced a new communication modality that was unlike anything that came before it. At least emails were similar in concept to actual mailed letters, but the notion of social media chats, likes, shares, and trends were like nothing marketeers, or humans in general, had seen before. It has now been about two years since we could safely begin to say that most enterprises have a presence on the major social media channels and now we are due for another major epoch in Internet history: the rise of the digital assistant. Once again the scramble for adoption and integration will be like nothing we have seen before. The stakes will be higher, the variety of outlets more profound, and the output of actionable data profoundly more rich. During the first Internet epoch, mass adoption of the World Wide Web, the few new modes of communication that surfaced were natural replacements for their predecessors: email replaced real mail and early search engines (although not particularly effective) replaced the Yellow Pages. These were straight-forward changes that were relatively easy to implement on the enterprise side. During the social media epoch, posts began to replace emails as a means for marketing a product and providing customer service. The new epoch that is upon us, however, represents an explosion of modalities that are very personal in nature and as diverse as they are disruptive. Consider that the past few years alone has seen the rise of personal digital assistants and the rapid fading of traditional industries like newspapers and taxi services in lieu of delivery methods that are made more personal by making full use of technological advancements to meet customer demands. Two years ago, very few of us were barking orders into our smart phones to do things like send a text, schedule an appointment, or get the weather forecast. Today, most of us do this multiple times a day except we aren't just barking orders at a phone any longer, we are also interacting with smart watches, smart speakers, smart media consoles, and even smart refrigerators! Some may define this epoch as the IoT (Internet of Things) epoch, and that is fair, but we think it goes farther: it isn't just about making the devices around you smarter and more connected, it's about making the smart and connected devices around you create a more personal experience tuned to your precise needs. So what has all of this to do with enterprises? To us the answer to that question is clear: customers have adopted the digitization and personalization of everything as rapidly, if not more so, than they did social media and are already demanding that their needs are met in a personal way using the modalities that they prefer whether that be via an Amazon Echo device, a personal assistant like Siri, Samsung Voice, or OK Google, or any number of emerging smart, connected appliances such as televisions and refrigerators. Connected devices offer skills that their owner can request on demand with the simple use of their voice. For example, Domino's Pizza has released a skill on Alexa--the personal assistant behind Amazon's Echo devices--that allows customers to order a pizza. There are many skills that can be created to give your customers new ways to engage with your brand such as online ordering, product recommendations, order status checking, and so forth. For example, a Vineyard that published a skill allowing customers to ask for the best wine to pair with the dish they are cooking. A local urgent care facility could allow customers to set an appointment as they gather their keys and put their feverish toddler into the car so that their wait is limited when they arrive to the facility. Enabling skills of this type of personal nature tip the scale when customers are deliberating with whom to do business. The digitization of everything does not only represent a change in how customers engage with brands, it also represents a change in the way operations can be carried out in an enterprise environment. For example, enterprises are beginning to embrace the concept of an office digital assistant in order to make both knowledge and trade workers more efficient. Each day brings new mash-ups between these digital assistants and common enterprise platforms like Salesforce, Slack, or even Microsoft Office. Building a skill to accomplish a particular enterprise task on these digital assistants does not necessitate the need for typical user interfaces which results in a much lower development cost and more rapid delivery schedule. According to Cisco, 60% of 2000 surveyed organizations indicated that they are seeing a positive ROI on their investments in personalization technologies. As we enter this third, and very transformational, epoch of Internet history it will be critical that enterprises adapt and adopt digital assistants quickly to avoid being left behind by customers and employees who wish to engage with your brand through the use of them. At Polyrific, we have experience in developing digital assistant skills and tying those skills to established enterprise libraries that integrate back end systems like Salesforce and Oracle. Don't be left behind in this revolution, please contact us to learn more. As we have previously written, 5G New Radio (NR) cellular data transfer and millimeter wave technology was a much buzzed-about technology and important trend towards an infrastructure that can may be able to quench our growing thirst for a connected world. 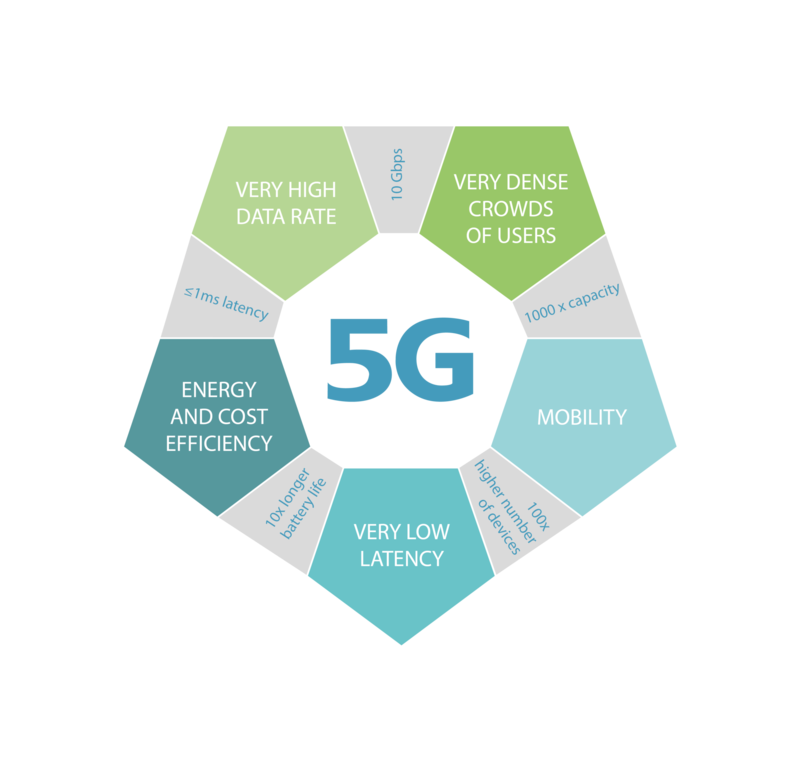 Broadly, "5G" describes the next generation of post-4G mobile networks. It will be always-on and have almost imperceptible latency. 5G is like nothing we have seen before. Whereas 4G can transfer data at 100 Mbps, by 2020 5G will transfer data at a searing 10 Gbps. Some experts even speculate that 20 Gbps are possible. To put this into perspective, 20 Gbps data rates will allow you to download a two hour long high definition movie to your smart device in just over one second. The importance of 5G speed isn't in the fact that we can download more media in less time--5G is important because of the industries it will enable such as streaming 8K video for digital medicine, data streaming for self-driving cars, mega-encryption for the Internet of Things, and smart cities. Smart Cities were a major theme at CES 2018 and served as a superset of constituent technologies such as AI, self-driving vehicles, and the Internet of Things. Around the world populations are booming and cities are scheduled to represent 60% of the worldwide population by 2030. In order to operate efficiently and cost-effectively, cities will have to implement smart infrastructures that help to better manage traffic, reduce accidents, improve waste management, analyze terabytes of video for a variety of public concerns, aid in water sanitation and wastewater management, and provide thorough public safety services for our changing threat landscape. Virtual and Augmented Reality were everywhere at CES 2018 and while the VR side of things provides a very immersive and interesting entertainment experience, we haven't been as convinced about AR (augmented reality) until now. Most of the firms pitching AR technologies at CES had some sort of goggles or glass that the user needs to wear which we think should be reserved for very special use cases. What piqued our interest, however, were the growing number of companies creating useful AR apps that can be used in a familiar handheld way by anyone who owns a smartphone. 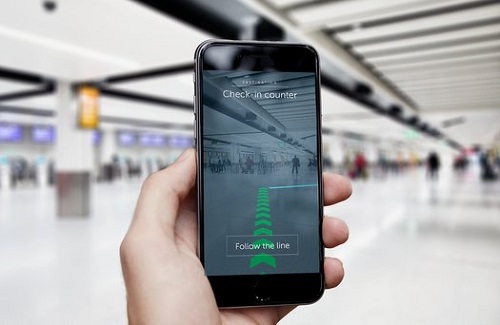 A very simple use case for this technology is waypoint finding in shopping malls, casinos, amusement parks, museums, and airports. Although virtual assistants have been making waves for a few years now, the intensity was ratcheted up even more during CES 2018. Siri, Cortana, Bixby were a bit scarce at the show--perhaps they were hiding in the shadows of Alexa and "Hey Google" (notice a syllable missing from the previous "OK Google") which are fast becoming the undisputed titans of the space. 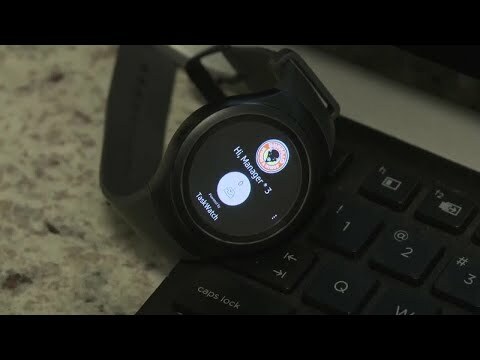 It's easy to understand why this is: Where as Siri, Cortana, and Bixby are confined to their respective devices, Amazon and Google have worked hard to open their VA platform so that it can be used across multiple devices to span the life and clock of its user base. Expect to see a common virtual assistant experience that knows your individual context and follows you from home, into your car, to the office, and back home again very soon. 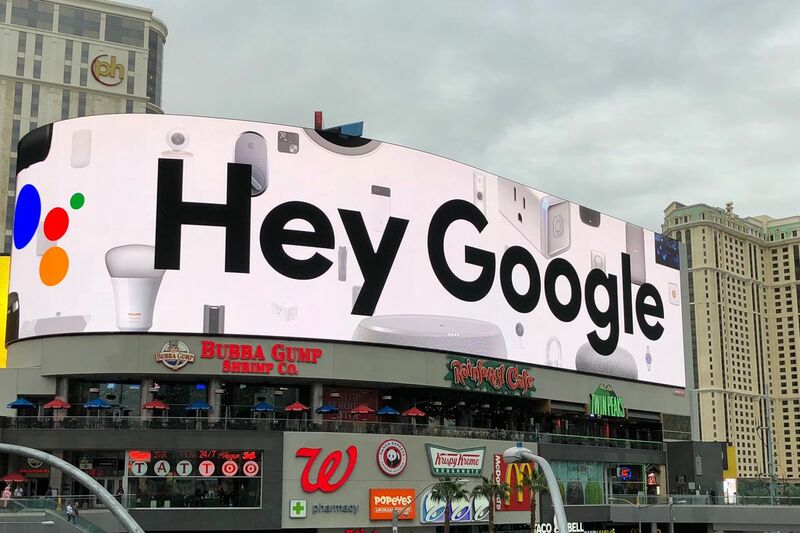 Alexa and Hey Google enabled devices were everywhere at CES. With healthcare becoming more complicated and less affordable (at least in the US) than ever, we see the new wave of digital medicine as a major force in the healthcare market. Enabled by other emerging technologies such as 5G, 8K video resolution, and IoT, patients will soon be able to consult with affordable health care providers directly from their homes for the most common non-emergency situations such as flu symptoms and sinus infections. We look forward to watching this technology and hoping for a positive impact on our society. As we see it, these are the five trends that mattered at CES 2018 and are worth keeping a close eye on as we progress throughout the year. Sure, there are other notable technologies such as self-driving cars, but we think those already get enough air time even though they aren't quite ready for prime time. Feel free to contact us if you need any help in understanding or developing software for use in these areas. Impresarios of hip hop have long spawned businesses that capitalize on their personal brand. Jay-Z publishes music under his Roc Nation brand, Sean "Brother Love" Combs peddles vodka under the Cîroc label, Lil Wayne joins the fun with Bogey Cigars, his Cigar company. 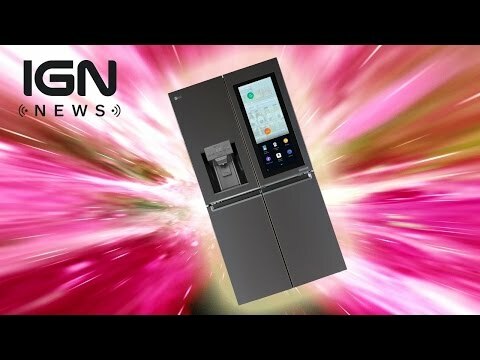 So will Omega carry the same moxy in the office as Alexa, Siri, and OK Google do in the home? It's too early to tell really. Hip hop and enterprise IT seem to be strange bedfellows but who knows--maybe Omega will get it started in the office, finally. According to a recent Gartner survey, only 37% of CEOs and other senior managers rate the efficacy of machine learning as being transformational to their enterprise. This isn't too surprising, really. We commonly hear about tech giants such as Facebook, Google, and Netflix who are applying machine learning solutions to problems faced by hundreds of millions of people and so the notion somehow makes more sense when considered in that mass-market context. As with most cutting-edge technologies, however, adoption tends to go from a trickle to a roar. Consider, for example, the automobile, the personal computer, and the cellular telephone. These were all technologies that seemed over-the-top at the time of their creation with few thinking that these things would be useful to a business, let alone a household. But of course, history has told us a different story. It turns out that the problem isn't with the technology, the problem is with our ability to envision the use of the technology which leads to the point of this article: How is machine learning actually useful to most enterprises? In this article, we will answer that question, but it is helpful to start with an analogy. Machine learning is great at detecting patterns in unstructured data and then formulating conclusions. This is the kind of thing that humans are generally good at doing. For example, if you go to a car dealership and notice that there is only one car remaining from the previous model year, and it's the end of the month, you somehow realize that you can probably negotiate a great purchase price for this vehicle. But how did you know that? You knew it from prior articles you have read and advice your friends have given you with regards to getting a great deal on the purchase of a vehicle. You might have also picked up on visual cues at the dealership such as a "Must Sell!" sticker on the car. This is what machine learning does except that instead of drawing only on individual experience, it can draw on the experience of hundreds or thousands of people who have been through similar scenarios in order to formulate positive insights and conclusions. There are troves of data containers collecting dust at every enterprise stored by your CRM, ERP, email servers, and documents as well as external data sources such as news stories, weather events, commodity prices, etc. Implementing machine learning algorithms across this data can help you to develop insights about shortening your sales cycles, the communication cost around certain internal processes, employee and customer sentiment, customer buying habits, new product recommendations, and so forth. Consider a machine learning algorithm that draws upon this information to help prompt you with tips on when to close a deal (and at what price). Or consider a machine learning algorithm that can help you spot communication gaps that are leading to quality defects on the production line. These things may seem like uniquely human problems, but they aren't. Machine learning is excellent at detecting patterns, optimal timing for events, and even emotions. How would it impact your enterprise if you could predict the optimal time to launch a product, close a deal, raise your prices, discontinue a product, or even liquidate bill-of-materials stock? Fraud detection via machine learning is already widely adopted for credit card companies and insurance companies, but what about putting that same pattern recognition technology to use in your enterprise to help resolve and steer customer service and return matters or perhaps where sales or productivity is being over or under reported by employees? Machine learning is excellent at classifying documents. You already use machine learning based classification if you have a spam filter on your email client. This is no more than an algorithm that has learned to detect patterns in email text that has a high probability of being spam. What if you applied the same logic to help your employees classify and organize emails, comments, documents, Slack posts, etc by project, or recommend that they should not copy people to whom the information would be unnecessary while copying others who may have the ability to answer questions in their emails. Machine learning can also make short work of crawling hundreds of thousands of historical documents, parsing their content, and storing them in a database for further analysis. This is not only true for word processing documents and spreadsheets, but it's also true for images, video, and audio as well. Machine learning can help to automate many processes within the enterprise by consuming unstructured data, such of scanned bills-of-lading, and taking the appropriate action to update your systems. What's more, machine learning can even help you to identify which processes can easily be automated in the first place. The medical community is using machine learning for diagnosis more and more frequently but what about diagnosing equipment failures, detecting conflicts in a set of building design documents, and finding manufacturing processes that are the root cause of defects? Machine learning handles and solves this kind of diagnostic problem very well. Machine vision is a trait enabled by machine learning wherein streaming video or images can be processed and certain objects within them can be recognized. This can help you sort through thousands of hours of footage when looking for a particular event, recognize installed quantities on a construction site, keep tabs on deliveries, and even let you know when the lawn should be tended to for a rental property. Product recommendations are sort of old hat at this point, but is your enterprise using a good recommendation engine? You should be--targeted recommendations to your customers based on conclusions drawn by machine learning algorithms can increase sales by 50%-60%. Even if you don't run an ecommerce business, you can use these algorithms to tip you off as to when to send regular mailers to certain customers. There are some who believe that the next wave of enterprise software will be powered by machine learning and here at Polyrific, we agree. If you are interested in exploring the possibilities offered by integrating machine learning into your enterprise, we are here to help. We can be both a creative force driving your team towards greater heights with this ground-breaking technology and we can also handle the implementation. Working with us doesn't have to mean that we are building software for you, though we'd like to; we can simply be a source of ideas and direction. 11 Here Come the Bots!